Situated on the end of the Säikkäräniemi headland, shaped by the Ice Age. An area of historical fame for festivities and lawful judgement for the indigenous Sámi people for centuries. 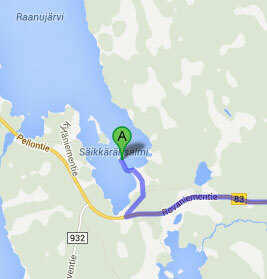 Located on lake Raanujärvi, around 60 km west of Rovaniemi airport and at the top of the Säikkäräniemi headland. The villa accommodates 12 persons. The historical setting and surrounding natural spectacle will make any visitor speechless. It feels as though time stands still. Inside Villa Säikkärä, the same timeless atmosphere continues. The cosy log-built villa accommodates and caters for its guests while respecting traditions in the appropriate manner. Lappish hospitality is provided by the Säikkärä host, Risto Kauppinen, who personally receives his guests. It is a matter of honour for the host to ensure his guests enjoy their stay and experience the true Lappish atmosphere. At Villa Säikkärä we eat when we are hungry, sleep when we need a rest. Located on lake Raanujärvi (60 km west of Rovaniemi airport and at the top of the Säikkäräniemi headland). Indoor sauna, a raft ride on the lake is also possible upon request. Twin rooms may be adapted to double rooms if required.